Morclean prides itself on being at the forefront of modern cleaning innovation. Many people are now converting from high pressure jet washers to a more eco-friendly, cheaper to run, machine – which is why the new generation of steam cleaners are at the very top of the game in the cleaning sector. Steam is efficient and easy to use, producing far less wastewater and consequently is a lot cheaper to run in the long term. Steam is also much safer than a pressure washer in cleaning environments and produces a high quality finish without the need for chemicals. It is favoured by many industries for its sanitary finish, killing over 95% of bacteria using just high temperature steam. Used across the board in hospitals, kitchens, warehouses and by valetors for both the external and internal hard to reach parts of a car; even engine cleaning – everyone has a use for the new ‘reduced water’ generation of steam cleaners. Available in dual outlets, battery powered, 3 phase, mains electrical and with chemical options, steam is where the cleaning industry is going. 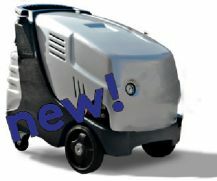 The new VapourSteam 9000X is a powerful, all electric 3 phase vapour steam cleaning machine. It’s ideal where fumes and/or emissions can be a problem. The VapourSteam 9000X produces steam at temperatures of up to 180ºC using 20 Amps to produce an impressive 13.5 Kg per hour of steam. The new generation VapourSteam 500X provides simultaneous steam for two operators, making it the ideal car valetors machine where only low volume steam is necessary. The electric driven, diesel fired VapourSteam 500X is a twin operation vapour steam cleaner with steam reaching temperatures of up to 180ºC and features safety devices and easy operation. 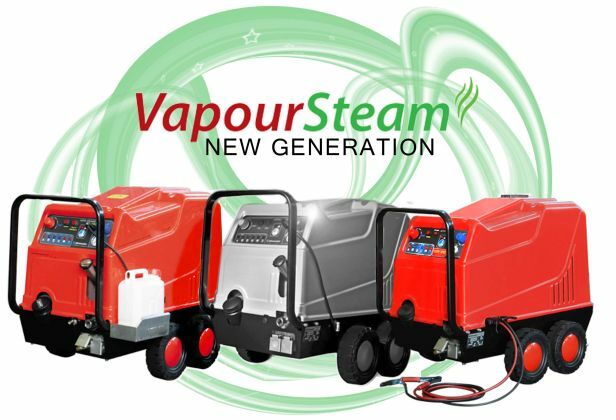 Designed for mobile use, the VapourSteam 500B is a steam cleaner that can be run from a spare 12v car battery – or the vehicle itself. This vapour steam cleaner has 2 outlets and can be used by 2 operators at the same time. It has the same performance as with the 500X but from a battery instead of mains. 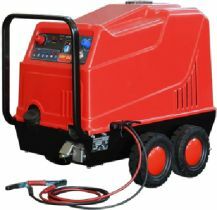 The VapourSteam 500B is the ideal machine of choice where mains power is not readily available such as mobile steam cleaning or on site valeting. 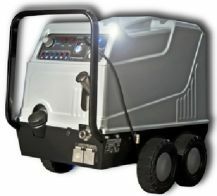 The VapourSteam 2240X is a hybrid vapour steam cleaner with dual user combination which we consider to be unique to the industry. The 2240X is the perfect machine for car valetors who require both methods of cleaning – vapour steam and high pressure. The electric driven, diesel fired VapourSteam 2240X has 2 hoses and guns which can be used simultaneously, one using high pressure water and one with steam. Low-pressure detergent can also be utilised. How long does it take to wash a typical car using the VapourSteam? It takes one operator about 10 minutes to clean a moderately dirty, average saloon car. How much water is used per car wash? On average, the VapourSteam consumes 6 Ltrs per hour of water to clean a moderately dirty car, we estimate at 10 minutes washing time just 1 litre of water will be used. Does the VapourSteam dull the paint or take away any shine from the vehicle’s surface? The VapourSteam will effectively loosen more surface contaminants faster and gentler than a high volume, cold water pressure washer and use less detergents. Can I clean vehicle interiors with the VapourSteam? The VapourSteam can easily clean the interiors of a car. You can steam clean vinyl and upholstery while removing stains and odours in less time than a cold water carpet extractor. Using steam, interiors are dry within seconds using less water than other methods. How well does steam remove brake dust from wheels? The VapourSteam easily removes brake dust and for faster results we recommend applying a degreaser prior to cleaning with steam. Can steam be used on leather interiors? The VapourSteam works well on leather by lifting dirt that has settled into the leather’s cracks and crevices. How many cloths are used during the car wash process? It takes roughly 4-6 microfibre cleaning cloths to clean a vehicle but you can reduce the amount of microfibers used per car wash by folding the cloth into halves. How much fuel does the VapourSteam consume? The VapourSteam consumes 3 litres per hour, but only if the burner is continuously on. Can I adjust the water content in the steam? The VapourSteam has an additional water valve adding water into the output of steam. The operator may require more water in the steam in order to clean heavily soiled portions of a vehicle, such as wheels or wheel arches, while interior cleaning should be carried out at the minimum level. How many wash guns will the VapourSteam operate? What type of water does the VapourSteam require? For most uses, tap water is sufficient. Does Morclean offer a machine powered by LPG? Morclean does not presently offer VapourSteam machines powered by LPG in the UK. Morclean provides lifetime technical support to all customers, please see our contact us pages. Practical use of the machine. Can the VapourSteam produce continuous steam? The VapourSteam produces continuous steam pressure and the boiler automatically adjusts its output to maintain continuous pressure if water is added to the steam stage. Can the VapourSteam use other fuel sources? In addition to diesel, the VapourSteam350X can operate effectively using kerosene or biodiesel. The VapourSteam is very quiet. The noise produced by the VapourSteam350X is less than that of an equivalent hot water pressure washer or traditional steam cleaner. Does the VapourSteam produce a lot of exhaust? The VapourSteam burner automatically ignites to maintain operating pressure reducing exhaust and fuel consumption. Does the VapourSteam require oil? The VapourSteam do not have pumps or engines nor do they require any oil for lubrication. Will vapour steam damage the vehicle? Can washing a vehicle with steam vapour and microfibers scratch the surface? When used correctly, using steam and microfiber cloths will not create scratches. Vapour steam quickly loosens traffic film and grime and an operator follows the steam trail with a microfiber towel. Dirt is gently transferred from the vehicle’s surface onto the microfiber cloth. Are there any parts of the vehicle to avoid cleaning with steam? We advise not use the VapourSteamon radios, speakers, dashboards or on exposed electrical components. Will high heat damage the vehicle’s surface? When steam cleaning a vehicle using the VapourSteam, the tip of the spray gun is held 4-6 inches away from the surface of the vehicle. At this distance the steam cools very quickly and the temperature is much lower and so will not cause damage to the vehicle’s surface. Will steam remove wax from a vehicle’s surface? The steam cools quickly and doesn’t maintain contact with the surface for very long, as above, but if you need to remove wax simply hold the spray over a particular surface until the wax is removed. Will steam remove decals from a vehicle’s surface? The steam cools quickly when used a distance away, as above, but to remove decals simply hold the spray over a particular surface until the decal’s glue loosens and the decal can be gently removed. Is the VapourSteam safe to use? The VapourSteam Steamer has safety features that protect both the operator and the machine. Steam cools quickly meaning the operator is safe. Features include pressure and temperature control switches, water and fuel level sensors, pressure release valve, non-return check valves etc.